Baritone David Newman enjoys an active and varied concert career throughout North America. Hailed as “electrifying” by the Washington Post and noted by The Philadelphia Inquirer for his “eloquent, emotional singing,” he is best known as a Baroque specialist. 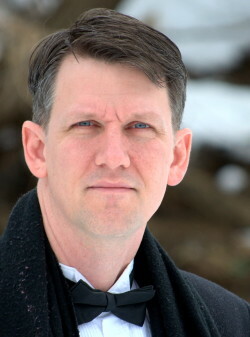 He has performed Messiah with Tafelmusik, Portland Baroque Orchestra, Jacksonville Symphony, and with Masterwork Chorus in Carnegie Hall; St. John Passion with the American Bach Soloists, Carmel Bach Festival, and the Bach Chamber Orchestra of Honolulu; and St. Matthew Passion with the Bach Society of St. Louis, San Francisco Bach Choir, and on tour with the combined forces of Santa Fe Pro Musica and the Smithsonian Chamber Players. In his debut with the Washington Bach Consort, Mr. Newman was noted by the Baltimore Sun for his “exquisitely phrased, velvet-toned Mache dich, mein Herz.” Other notable appearances include Bach’s B Minor Mass and Christmas Oratorio with The Bethlehem Bach Choir, Coffee Cantata, Easter Oratorio, and Christmas Oratorio with the Santa Fe Bach Festival, and Haydn’s Creation with The Honolulu Symphony. His European appearances have included the 2003 Berlioz Festival in Paris, Le Tournoi de Chauvency with Ensemble Aziman in Sarrebourg and Metz, and Le Roi et le Fermier with Opera Lafayette at the Opera Royale in Versailles. He has appeared regularly as a guest artist with the Four Nations Ensemble, including performances in Lincoln Center and Merkin Hall, and has also performed with the Spoleto Festival, Opera Company of Philadelphia, Metropolitan Opera Guild, Opera Birmingham, Philadelphia Orchestra, and the Russian National Orchestra. He has recorded opera and oratorio for the Philips, Dorian, Analekta, K617 and Naxos labels. Mr. Newman teaches voice and music theory at James Madison University.